With a good camera, you can start a photography business, keep your friends updated on social media, record videos of events, and catch the fun with others taking selfies in historical places. But remember that to capture those pictures that actually pull the crowd, you need a smartphone with a good camera. You don't need to be a professional photographer to differentiate between good and bad phone camera. 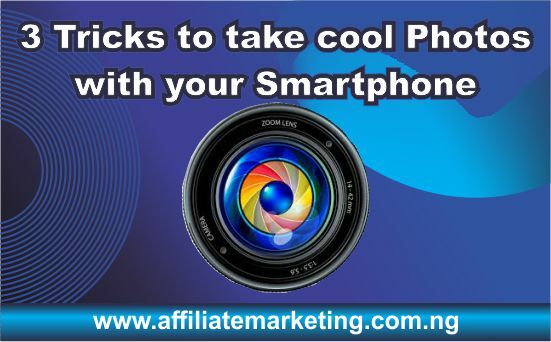 I will briefly explain the camera features to put an eye on when purchasing a smartphone. These features are enough to help you identify a good camera that will capture quality photos anytime any moment. There is an extensive list of the number of camera features to check for in a smartphone that will deliver your coolest photos. Features such as sensor pixels, focal length, motion control, lighting, coverage area, flash rating, among others determine the quality of photos a camera can capture. However, some of the features are key. I have described these features below to guide you in making a perfect choice. This represents the number of dots of an image the camera can capture per given area, usually measured in millions. The value is usually a number with MP signifying megapixels, e.g. 13MP which captures 13 million pixels. Every smartphone has this specification well stated at the back close the rear camera. Alternatively, the packaging material can be checked for the specification of the camera. With this, you should always look out for phones with better camera pixels. A factor you might want to consider here is the cost of such phones. Smartphones such as Nokia 8, Nokia 7 Plus and Tecno Camon X Pro have higher camera pixels, but cost a value to purchase. Anyway, you'll get the value for the money you spend on them. This might seem less significant, but it's definitely something you should consider, especially when the need to capture pictures in the dark arises. Photos taken in dark environments can become useless if the lack the appropriate illumination. This illumination or lighting is provided by the flash available on the smartphone. For casual pictures, a smartphone with flash capability is enough to provide the needed lighting to take photos in dark environments. If you intend to dig deeper, then check the number of flashes the camera possesses. You might also come across ratings such as dual flash, autofocus, with focal length measured in inches such as f/2.6, f/1.8, etc. The larger the focal length and lighting, the better the images you can capture with it, especially in a dark environment. There is always this argument on whether the pixels of a camera affect the quality of photos you take. While you might be tempted to outrightly answer yes, understand that there is a thin line in performance which is dependent on the sensor size of the camera. For instance, an 8MP camera will capture the same quality of photo captured by a 13MP camera provided both cameras possess the same sensor sizes. This is what appears to be most confusing, especially when your 12MP camera appears to capture inferior images compared to your friend’s 8MP camera. Don’t get into this confusion, the defining factor is the size of the sensor. In standard cameras, sensors are measured in millimetres referencing the height and width. But smartphones possess smaller sensors and as such have theirs measured in fractions of inches. So, you will often see measurements such as 1inches, 1/2.3 inch, etc. This combines perfectly with the pixels of the sensor to determine the overall quality of the photos taken by the camera. Sometimes, you might want to capture moving objects, a friend that is running or playing football. Some cameras often render moving images in a seemingly disgusting manner. Often too blurred for you to make anything out of the photo. This has long been addressed with recent smartphones integrated with cameras that monitor the motion of objects, helping you capture good images on the move. However, there are still a number of smartphones on racks that fail to handle this imaging concerns. While some others have been able to handle a bit of it, others a few others still fail to do so. Hence, you have to ensure that the camera of your smartphone has the ability to capture moving objects if you ever plan to capture one. My advice is that always go for one that renders mobile images in a good way. You never can tell when the need to capture one photo will arise. The long talk on how to identify a phone with a good camera is finally over. So let’s focus on the three tricks you use to take cool photos using your smartphone. You can use this tricks to take direct images or selfies. I have described in a separate post on how to take selfies conveniently with a smartphone. 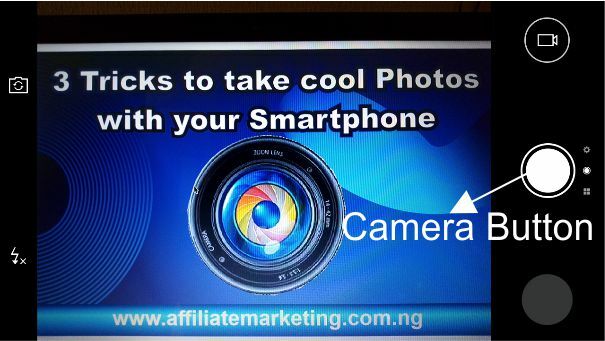 Every smartphone comes with a default button or user interface to take photos once the camera application is launched. For most smartphones, this interface is usually at the centre of the downside of the screen. Taking pictures with this method is now a universal thing as even a baby can easily do that. However, there is the possibility that you are using a smartphone for the first time and seem to find it difficult taking pictures with it. Then, this will be the simplest trick to use and take your first shot. The first thing is to launch your camera app. You can locate this on the home screen, media folder, or among the list of applications on your phone. Once the app is launched and the screen is displaying the view of the photo you want to take, steady your hold on the phone and tap the camera button in the middle to take a shot. Depending on the OS and theme or launcher your phone is using, the display of the interface might be slightly different, but you get the same result. Now you have taken a good shot using the well-known method for taking photos. That’s really cool and simple to do without much fuss, and it appears to be the default and convenient way most people take pictures with their phones. This favours selfie fans but works for both cameras – front and rear. It relies on the fact that you need to press the button with just a hand’s grasp of your phone. To use this trick, launch your camera app and focus it on the object you want to capture. Now, press Volume Down button once. Release the button immediately after pressing it once. Doing so will capture the image of the object you focused the camera on. You can take multiple photos at the same time using this method, rather than making changes to the camera’s settings. Simply press and hold the Volume Down button for a given time depending on the number of photos you want to take. The longer you hold the button, the more photos the camera will capture. This is third and coolest way of taking photos, especially for the big guys out there. With just a tap of the finger, you can take as many photos as you want. But, your phone must have a fingerprint sensor. 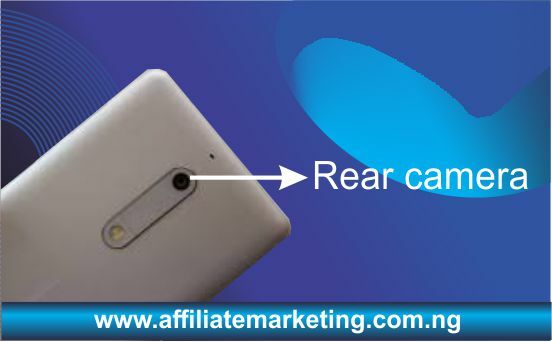 This can be located at the rear or front of the phone depending on the brand of phone you are using. Once your phone has the fingerprint sensor, set up a fingerprint account so you help the phone to recognise your biometrics. You can choose to use the left or right hand – the choice is yours. After successfully setting up a fingerprint account, you good to go. Well, before I show you how to take photos with this, note that you can use the fingerprint sensor for a number of things on your phone. In addition to taking photos, you can browse pictures, record calls, control access to your phone, and equally receive calls. You can read more on fingerprint sensor here. Ok, let’s move to how you can take photos with the fingerprint sensor. First, launch your camera app and focus the camera on the object you want to capture. With one of the fingers scanned while setting up the fingerprint account, tap the fingerprint sensor to take your photo. The number of times you tap on this sensor, while the camera app is active, equals to the number of photos you will captures. This method works really good for selfies as you would conveniently take your shots without affecting the layout of the photos taken. These three tricks work perfectly for both cameras. So, you can take selfies, groupfies, or default photos using them. However, you might sometimes need to capture screenshots. How do you do that? To capture screen photos with your smartphone, you don’t need to launch any camera app. Even if you launch the camera app on your phone, its interface will be captured as a screenshot. At any screen or interface you want to capture, just press both the Volume Down and Power buttons at the same time, once. Pressing these button that way will result in the screen being capture. Now you can take as many screenshots as you wish by pressing down these two buttons for a given time. The longer you press, the more screenshots that will be captured. Pictures bring excitements to us when we see our moods during fine moments with friends and colleagues. So, knowing cool ways of taking these photos with much stress is something everyone would love. These tricks have described to add value to your fun fare and keep you eager to take more photos. If you’re already familiar with them, kudos to you. Enjoy the show. Otherwise, start using these tricks and feel the convenience of using them.